Happy Friday to you! There is so much happening at Sew Blessed since opening day! We just can’t wait to share with you! 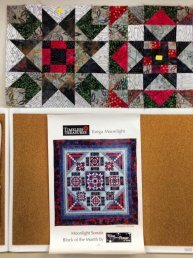 First, a HUGE thank you to all who have supported us since opening day – it has been a blessing to meet so many who share in our love of quilting! 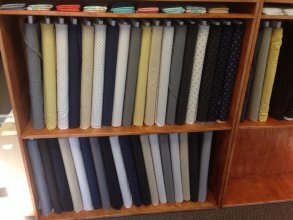 We have enjoyed helping you pick out fabric and projects and can’t wait to help you pick out many, many more! Our Block of the Month programs have been a hit! Moonlight Sonata has 2 spaces left! So, if you are debating about joining us for this gorgeous batik BOM, don’t wait! Call us or stop in today! There are spaces left in Whooterville by Crabapple Hill and Kim Diehl Simple Whatnots Club II also! Sharon has been busy making samples for us. She just finished the Farmhouse Window Sills sample and it is wonderful! So for you ladies who love embroidery work, stop in and check out the kits of these! A new selection of notions, including 505 Spray and Strip Tube rulers arrived this week, along with some new patterns. 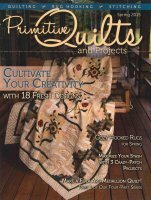 The new Primitive Quilts and Projects magazine arrived too! Next week we will reveal a batik quilt using the Strip Tube ruler! Well, I best get back to working on some more samples! Be sure to watch for our newsletter next week! Check us out on Facebook!